Petco Park has lost its new park smell, the Padres have lost many games, and many fans have lost that loving feeling. There is a lot of work to be done in San Diego, and overwhelming success isn’t likely to occur in 2010. Fortunately, between the new ownership group and some exciting young talent, the Padres appear to be on the right track…even if it’s a slow and sometimes bumpy track. How will Chase Headley respond now that he’s back at third base? Miscast as a left fielder, the former top prospect finally gets the chance to play every day at his natural position. 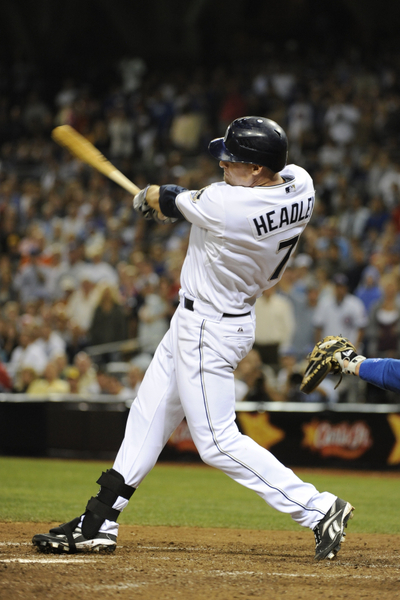 By Headley’s own admission, he was never going to be anything more than an average outfielder. With the trade of Kevin Kouzmanoff to Oakland, Headley returns to the hot corner, where the hope is that with less to worry about defensively, he can focus more on his hitting and become a force in the lineup. Headley’s first two full seasons in the big leagues have been solid, but nothing special. His list of comparable players includes such luminaries as Greg Briley, Leon Culbertson, Leon Roberts, and Willard Marshall. Part of the problem is that Petco Park destroys Headley’s game (.218/.305/.355 in 455 PA, vs .301/.368/.437 in 546 PA on the road). Moving from left field to third base won’t change that, but now he can spend less time thinking about how to avoid bumping into moving objects in the outfield and more time figuring out ways to produce at home. The sample is tiny, but so far, Headley has hit a little better when playing third base (.257/.348/.419 in 158 PA) than when playing left field (.261/.331/.387 in 812 PA). I would love to point to some study showing that players who shift positions magically transform into better hitters, but as far as I know, that issue remains one of baseball’s Hilbert problems. In what promises to be a recurring theme, the Padres and their fans will have to settle for hope. How good can Mat Latos be, and when will it happen? He could be very, very good. It could happen tomorrow. It could never happen. All of these statements are true, if somewhat less than helpful. On a more practical level, Latos has upside that the Padres haven’t seen in a young pitcher since Jake Peavy first arrived. Latos works with a mid-90s fastball and two advanced breaking balls. He is able to locate his pitches and has a clue. Latos also is young and inexperienced. His attitude has been questioned at times, but the same can be said of many people in all walks of life who are young and inexperienced. Having pitched fewer than 200 professional innings before reaching the big leagues, Latos remains a work-in-progress. Because he has options remaining and some other pitchers who need to be evaluated (Sean Gallagher, Tim Stauffer) do not, Latos could start the season at Triple-A Portland to buy himself and the Padres a little time. Wherever Latos starts the year, unless something goes horribly wrong, he figures to end it in San Diego. He also figures to be a key member of the next competitive Padres team. His stuff is top-shelf, but as Jeremy Bonderman (and perhaps Rick Porcello) has shown us, making the transition from the low minors to MLB isn’t always easy. In his favor, Latos has posted terrific peripheral numbers (10.5 K/9, 4.6 K/BB) down on the farm. On the other hand, that’s in the past and he needs to show what he can do at the highest level on a consistent basis. My suspicion is that he will succeed, but it’s easy to be optimistic about things that haven’t happened yet. Can Randy Ready survive the season as hitting coach? Granted, there are varying sample sizes, but it can’t be comforting to realize that each individual charged with getting Padres hitters to produce in their home ballpark has done a worse job than his predecessor. In retrospect, axing Magadan may not have been such a great idea (word is, he’s since experienced a little success in Boston, which by some strange coincidence has a park that is conducive to offense). But what’s done is done, and now the Padres have Ready, who benefits from the fact that presumably there isn’t much further to fall. He also gets to work with Kyle Blanks, whose power plays anywhere and who figures to make any hitting coach look good. As for whether Ready can last an entire season, that depends on a number of factors. Actually, it depends on one factor. At some point, the Padres must accept that Petco Park, where they play half their games every year, suppresses offense something fierce. I have no doubt that on a certain level, they are very much aware of this. At the same time, when different coaches continue to yield similar results, perhaps it’s time to look elsewhere for answers. Superior on-field talent is a good place to start. Which of the young players is likely to emerge this year? Blanks and Latos are the obvious choices. Although they are the best long-term bets, each comes with risk. Blanks is playing out of position and battled injury problems toward the end of his rookie season. Latos has very little professional experience under his belt. Everth Cabrera? You know what I think about him, but this is a kid who skipped three levels last year. He’s got a lot of talent, but also a lot to learn. Who knows when he’ll put it all together? The guys I’m looking at to emerge in 2010 are Headley and Will Venable. We’ve already discussed the former. As for Venable, because he’s already 27 years old and still not established at the big-league level, he often gets overlooked or dismissed. For example, our own THT Forecasts put him at .241/.298/.379 this year. I think he’ll beat that OPS by 100 points if he gets regular playing time (which he should). Venable won’t be a star, but he is a gifted athlete (he was a standout basketball player at Princeton, which helps explain his late development) who has usable baseball skills and he’s ready now. Former Padres Vice President of Scouting and Player Development Grady Fuson is quoted as saying he thought Venable would be a better big leaguer than minor leaguer, and I’m inclined to agree. What are the new owners doing? Will they increase payroll at some point, and can they restore fan interest in San Diego? The new owners have made a concerted effort to win fans back by reaching out to them in ways that previous ownership seldom did. For all that John Moores accomplished while running the Padres (World Series in ’98, Petco Park), he had become decreasingly visible in recent years. This aloofness did not sit well with San Diegans, who wanted a more active owner that at least gave the impression of caring about his ballclub. Add in a messy divorce, and voila: ugly situation. Jeff Moorad and President and COO Tom Garfinkel have come in and expressed a commitment to the organization, the fans, and the city. They have made themselves available to the people and demonstrated a willingness to listen and improve where possible. The previous regime had trouble with that aspect of the job. Sandy Alderson, as brilliant a baseball mind as you’ll find, showed little patience for details that didn’t affect the bottom line. He and his group succeeded in many areas, but never really connected with a fan base that sought a kinder, gentler leader. San Diegans wanted to be addressed as equals in a partnership, not as subjects of an oligarchy. That was not the style of Moores and Alderson, and one got the sense toward the end that ownership and fans regarded each other as necessary inconveniences. In six short years at their beautiful new downtown ballpark, the Padres have seen attendance plummet from a franchise high to lows last experienced in the wake of Tom Werner’s Infamous Fire Sale and the subsequent labor dispute that ruined everyone’s plans. At that time, when the threat of contraction was Bud Selig’s weapon of choice, the Padres were mentioned as a possible candidate. If some of us get a little nervous when fan interest wanes around these parts, it’s only because we don’t want to see our team moved elsewhere. Not that this appears to be an immediate concern, but after a very close call in 1974 and vague threats in the mid-’90s (to say nothing of what Selig did to the Montreal Expos), it’s not as far in the back of our minds as we’d like it to be. Sure, there are reasons for the plunge in attendance: The team has been bad the past couple of years, previous ownership didn’t make nice when things were good, the economy stinks, people stop caring about a shiny new ballpark when they have other shiny new objects to distract them, etc. That said, there is no way to spin the numbers in a way that makes them look anything other than alarming. As for payroll, it’s going to be low for a while. On the bright side, several franchises have demonstrated that it’s possible to field a competitive ballclub despite financial limitations. On the not-so-bright side, many fans regard this fact as propaganda and aren’t interested in hearing about it. What can you do? Bonus question: How much longer will Adrian Gonzalez remain with the Padres? Not much longer. Enjoy him while you can and hope he brings something good in return when the time comes. Enjoy [Adrian Gonzalez] while you can and hope he brings something good in return when the time comes. If Gonzalez does wind up being traded to Boston for the expected passel o’prospects, I think we could start calling this team the Ex-Sox Pix. Not to cause any controversy or anything, but I believe it’ll take Kyle Blanks no more than two years to make San Diego fans forget Adrian. And he’ll cause us to remember him every time he’s chugging around 3rd on his way to being thrown out at home.